We were captivated by Steve and Kerry's story so we decided to feature it for our readers. Read how Steve and Kerry jumped feet first into a new home in Fethiye for a brand new life in Turkey. Steve and Kerry Walton-Black fancied a change. With retirement looming, the Southampton couple promised each other that they would do something completely different. "We always said that once our youngest left home we'd make a big change in our lives," said Steve. "And Francesca leaving for uni in September 2011 happened to coincide with my retirement so it seemed like a sign." As it turned out, they both had very different ideas. "I have a 48 foot yacht and I wanted to sail around the world," the retired banker said. "Kerry was a bit shocked - she'd imagined something a little more sedate!" Former legal secretary Kerry had her sights set on a seaside cottage in the South of France, in an area where the family spent many happy summer holidays. "We put our heads together and came up with a compromise," Steve said. "We decided to move somewhere warmer and by the sea where I could sail to my heart's content." They started looking at homes in the south of France, and got a shock. "Even a small, 2 bed, 1 bathroom cottage cost upwards of GBP500,000," Steve said. "We were disappointed, but after some discussion we decided to look further afield." A chance conversation with a former client of Steve's turned the couple's attention to Turkey, a country the Walton-Blacks had never visited. "I spent hours researching the lifestyle and property in Turkey obsessively," Kerry said. 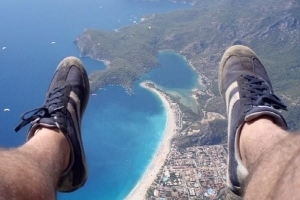 "It’s a huge country but one area kept coming back to me again and again - Fethiye." Drawn by the area's year round good weather, marinas and sailing links and good facilities, Kerry said that she was "sold on the area before I'd even set foot there." Steve was less certain but agreed to head out on a Turkey property inspection trip in January 2012. "As soon as we arrived and saw the sea and the harbour I knew Fethiye would be our new home," said Steve. "We just had to find that special home in Fethiye and claim our name on it. The couple looked all around the region for property for sale in Fethiye, from inland Uzumlu homes to mountain view villas in Ovacik, before deciding on a Turkish villa in Gocek, one of the south coast's most popular marina towns. The Walton-Blacks bought a 4 bedroom Turkish home a few minutes' walk from the marina. The villa has 3 bathrooms, a large terrace, private pool and a games room and cost GBP245,000 - half of what they would have paid in France for twice the space. "Yes, it is possibly a little on the large side for a retired couple," Steve said. "But we have had a steady stream of friends and family to stay, and our kids have been to stay twice - each time with a retinue of noisy friends, lord help us. We don't actually get much time to ourselves. If you want to reacquaint yourself with long lost friends and family I advise you to buy property in Turkey," Steve laughed. And what do the Walton-Blacks do all day? For Steve, the answer is simple: "Sailing, sailing, sailing. I can't get enough. Gocek is a sailor's paradise," he said. "The marina is just incredible, and the sailing routes along the coast are idyllic." While Kerry enjoys the odd day out on the water, she loves Gocek's upmarket shops, cafes and beach. "There's a fantastic market on a Sunday, we come down and buy fresh fruit and vegetables and have lunch or coffee on the waterfront. You can also get a ferry over to Fethiye if you fancy a bit of a change." The Walton-Blacks are unanimous that buying property in Turkey was the best choice imaginable. "I think we bought at the right time, too," Steve added. "In the year we have been here we have noticed that property prices have increased, due to the infrastructure improvements and the greater emphasis on tourism. We hope it doesn't change much because we like it just the way it is. The whole region is just fantastic - I can't imagine ever going back to the UK - our brand new life & home in Fethiye, Turkey is simply perfect."